Hello and happy Monday! 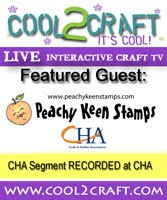 A few weeks ago when we had our new Peachy Keen Stamps release, I mentioned that I had one other project that I was working on using the newest Hillbilly Holler stamps, but I couldn't show it then, because it would have obviously spoiled the surprise anniversary plans that were being planned, but now that the surprise is out of the bag, I can share my project. I made this shadowbox using the invitation that was prepared by my son's girlfriend Kallista. Kallista's parents are the ones who were celebrating their 25th anniversary, and she created this wonderful invitation. Kallista and I, together with my daughter-in-law, Cassidy stamped and assembled the inviations. We sure had a good time being so sneaky, and we definitely enjoyed the crafty time together. I used my Cricut to cut the title letters, and the still image was colored with copics. I picked up some paper at my LSS, which matched the colors of the invitation, and added some embellishments, which I had on hand, and can be found at Peachy Keen Stamps in the accessory section. I hope they enjoy this little project as much as I enjoyed making it, and I hope it will bring back special memories of their surprise 25th anniversary party every time the look at it. Thanks for stopping by today. Have a blessed day and happy stamping! Oh my goodness! This is FANTASTIC!! And what a fun thing for you three ladies to do together. I bet Kallista's parents were beside themselves too at such an amazing gift! Total WOW, Lorie!!!! This is just awesome and so, so special. A keepsake for sure! Love the colors and the texture on the left side. And your title is so fab! I really need to break in my Cricut. Soooo...did this give Trevor & Kallista any ideas? Do I hear church bells???? Great prezzie! The colors are phenomenal! Was just checking up on ya, Sistah, cuz I haven't seen you around! !